Welcome to the last instalment of Dive Into JeeNodes. Let’a make an unattended setup! Everything is working now. The only step that remains is to automate things a bit further, so that the RPi will automatically start up HouseMon when powered up. This turns it into a fire-and-forget system, so that it becomes a permanent service on your LAN. Auto-startup is convenient, but it means we also have to think a bit about how to upgrade HouseMon. This is where the nodemon utility comes in: it can be used to start up a Node.js application, and restart it whenever certain source files change. This is mostly intended as development tool, but at this stage where HouseMon is still so young and evolving rapidly, it’s actually going to be quite practical – even in an unattended mode. The “-g” flag causes nodemon to be installed in a central location instead of as part of HouseMon, so that we can type in “nodemon” from the command line. This creates a “go.sh” script which will be used to start up HouseMon while you’re not around and sets up an entry in the “cron” table which will run that script right after reboot, even when you are not logged in. 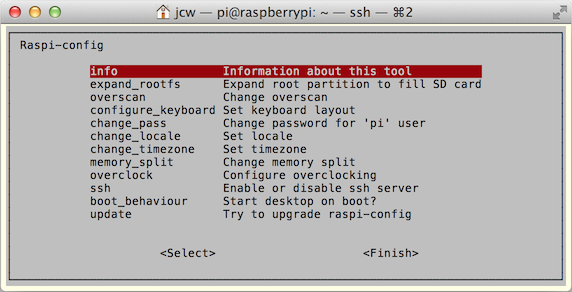 Warning: this loses any previous crontab entries, if this is not a fresh Raspbian install. Reboot now, using sudo reboot to start the ball rolling. After a few minutes, the RPi will be up and running again, and you will be able to visit the HouseMon server via your web browser – no need to log in for that! Congratulations: you have created your own personal Wireless Sensor Network, with a JeeNode sending out light readings once a second over wireless, to a JeeLink connected to a stand-alone Raspberry Pi, and via HouseMon running on Node.js, you’re able to watch the current light level in real time, from any web browser with access to your LAN. This also concludes this initial series of “Dive Into JeeNodes”. The goal was to set up a basic – but fully functional – system, as a baseline for lots and lots of further explorations. As far as I’m concerned, there will be many more posts building upon everything that has been accomplished so far. For now, I’d like to leave this to settle down a bit, and to reconcile loose ends – such as going through these 12 instalments using Windows. Since I don’t use Windows myself, I’m hoping that someone else will chime in with details, so that the exact steps to get going can be documented in a follow-up post or how-to page in the project. Cheers for now, I hope you’ve enjoyed this “PhysComp+WSN fun pack” DIJN series! PS – I’ve set up an SD card image pre-configured with Raspbian and HouseMon 0.5.1, so if you want to bypass all the setup work, download the hm051.img.gz file (550 MB! ), and follow the instructions in DIJN.05 to set up that SD card. Then insert the JeeLink and SD card, and power up the RPi. It’ll start with HouseMon running – including the demo page. Welcome to the eleventh instalment of Dive Into JeeNodes. Let there be light! Everything until now was nice, but wasn’t really about sensing the environment. For that, we need to hook up some sensors, obviously. 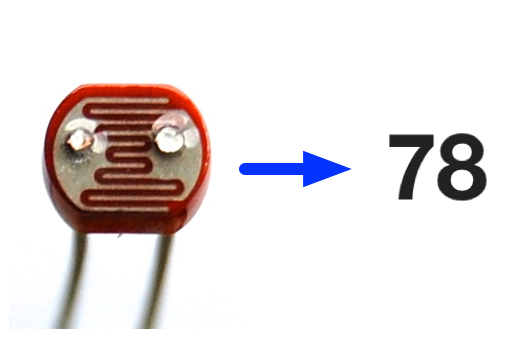 One of the simplest sensors around is the Light Dependent Resistor, or LDR, as it’s usually called. It does exactly what its name says: vary its own internal resistance, depending on the amount of light falling on it. As you can see, I’ve connected the LDR to the analog pin of Port 1 on the JeeNode (a JeeNode USB in this case – but any type of JeeNode will do). That’s it. If you now look at the Demo page in HouseMon again via your browser, you’ll see actual light readings. Put your hand over the LDR and see the value decrease in real-time (within a second, in this case, since that’s how often the JeeNode sends out a new packet). As you’ll see, the LDR is very sensitive. It has to be pretty dark for the value to drop under 100 (it ranges from 0..255). The range is also not linear or calibrated in any way. Congratulations… now you have a real WSN! Tomorrow we’ll take care of some loose ends. Welcome to the tenth instalment of Dive Into JeeNodes. Let’s show real-time data! 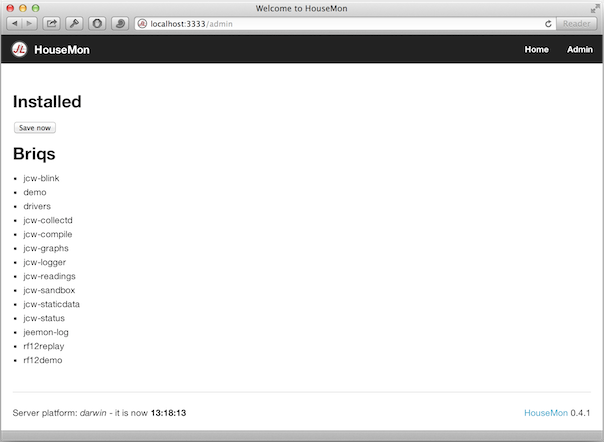 With HouseMon running on the Raspberry Pi, we can start to think how to show incoming data on a web page. The following approach is the most basic one possible: get the received packets into Node.js, i.e. the RPi server, “publish” each through a WebSocket connection to any attached client, and figure out how to get the received value onto the web page. Note that I’m running the server on my Mac in these screen shots, hence the “localhost” in the URL, but this will work in exactly the same way with HouseMon running on the RPi. Note also that the following three files are already included in HouseMon – they are just shown to explain what is going on. Lots of stuff going on behind the scenes, clearly, but this is what Jade looks like with Foundation CSS, and how AngularJS ties a dynamic “value” variable into a web page. It’s sort of like a template (but not quite, due to the two-way binding nature of all this). This one is a bit dense: it defines an AngularJS “controller” which will listen to incoming “ss-demo” events, and set the “value” variable we referred to in that Jade file above. A “Briq” is something which can be installed at run time in HouseMon. Once installed, that file above will run on the server side. Briqs are a new mechanism I came up with (it’s no rocket science, but at least the name is new), and it’s still very early days. Once I figure out how, briqs will be turned into self-contained directories with the above three source files all in one place. For now, each of those files needs to be placed in a very specific location, for SocketStream to be able to find and use these files. No installed briqs yet, but you can see some briqs which are currently included in HouseMon in the second list. We need to install two briqs: one to set up that demo page, and one to connect to the JeeLink. Once you’ve clicked on install, you’ll see a new “Demo” tab appear in the upper right. It won’t do much, though, because we’re not receiving any data yet! Click on the “rf12demo” entry, and fill in the serial port of your JeeLink. 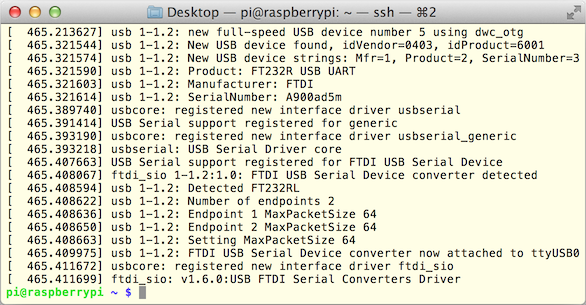 On the RPi, it’ll most probably be “/dev/ttyUSB0”, so just enter “ttyUSB0”. Then click install. Go to the “Demo” page, and if your JeeNode is powered up, you’ll see an updating value. Bingo – you’re looking at data coming from your Wireless Sensor Network in real-time. Welcome to the ninth instalment of Dive Into JeeNodes. We’re going to install HouseMon! I haven’t typed the final return yet, as this will generate lots of gibberish while npm does its thing. There is some package compilation involved, which means that the “npm install” step will in fact take a couple of about 10 minutes to complete. You’ll need to replace the IP address by the one assigned to your own RPi setup, but apart from that it should all work in exactly the same way. HouseMon is now up and running. Welcome to the eighth instalment of Dive Into JeeNodes. Let’s install Node.js! Now that the basic Wireless Sensor Network is up and running, it’s time to start thinking about the server-side software, which in this series will be HouseMon. For that, we need to get three pieces of software up and running on the RPi: Node.js, Redis, and git. Hit return when asked whether you want to install the updates. The first time around, this is bound to take some 15..30 minutes, as the system may not have been updated for quite some time, but later in it should normally takes no more than a few minutes. Easy, eh? Welcome to the world of open source Linux software. There are over 35,000 packages available. One way to explore what there is, is to use the menu-based “aptitude” command (type “sudo aptitude” if you’re curious, but be careful what you wish for!). Don’t be alarmed by the reboot, it’s merely a lazy way to log out and back in, which is essential for this one-time configuration change of the RPi. Wait a minute or two, and then you can log back in via ssh, as usual. That’s it. You can copy and paste these commands line by line, or all in one go – the latter is usually more convenient. The final “npm -v” command verifies that “node” and “npm” work properly by reporting npm’s version number when you hit return, i.e. “1.3.x”. 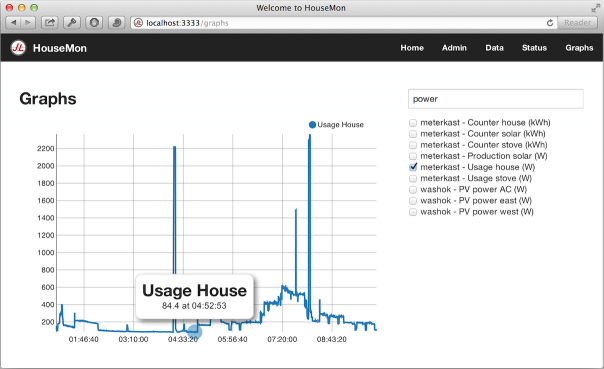 Lots of powerful tools… all in preparation of being able to install and use HouseMon. Welcome to the seventh instalment of Dive Into JeeNodes. Hello RPi, meet the JeeLink! With all the RPi setup out of the way, it’s time to hook it up to the hardware. Fortunately, most of the essential ingredients are already included in the RPi. The JeeLink is based on an FTDI chip, for which the driver will be auto-loaded by Linux when it’s plugged in. 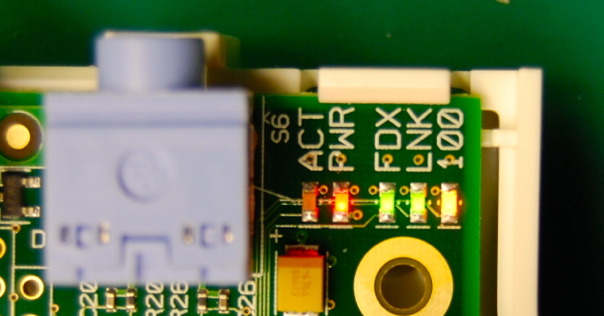 Plug the JeeLink in one of the two USB ports on the RPi. This is the kernel log, reporting that it has recognised the inserted USB device, has loaded a kernel driver for it, and has created a new serial “device” in Linux, called “/dev/ttyUSB0”. Yippie! 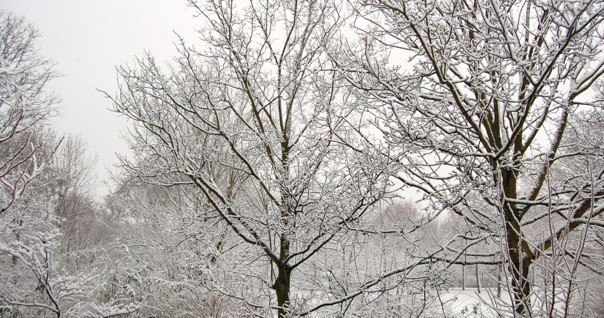 The JeeLink has restarted and shown its usual greeting, and is reporting incoming packets. You can hit CTRL+c to stop the process. For a help page in screen, type: CTRL+a, then ? At this point, all the hardware, all the connections, and all the wireless communication are now known to work. All that remains, is to set up the HouseMon server on the RPi and to connect the light sensor. PS. There may be a potential issue with the FTDI driver on RPi. Will need to test this later. Historical data is now stored in Redis. The plan is to keep the last 48 hours in Redis and then move it to some sort of aggregated data files, to complement the daily full log files. Lots of features in NVD3 which I haven’t explored yet. Out of the box, it supports hovering over a datapoint with a call-out to display the exact value, as you can see. The PDF version that gets generated when printing the page in Safari has several quirks (the shape is drawn as a closed polygon), and in Chrome the graph shows up as a black rectangle, so there is a price to pay for using this sort of cutting-edge technology – but on screen it comes out nicely. The “promise” you see in this code is a clever mechanism to deal with results which come back asynchronously, i.e. at a later time than when the RPC call returns. Most of the code deals with “massaging” the data, to get it into the proper format for NVD3. It’s nice to make some visible progress. for a change! Update – I’ve switched to Flotr2, smaller and better defaults for the time axis. Welcome to the sixth instalment of Dive Into JeeNodes. We’re halfway there! This part is probably the most complex piece of the journey called DIJN. Then again, you’re about to set up a self-contained server which can be used for a truly astonishing number of tasks. Linux is everywhere nowadays, and this is probably one of the easiest, lowest-cost, and most risk-free ways to tap into that world which has driven – and evolved alongside – the Open Source Software trend for so long already. Let’s get rollin’, shall we? Insert the SD card you prepared according to yesterday’s post into the RPi. Note that it has to be inserted with the label facing down. Connect the Ethernet cable on both sides to hook up the RPi to your LAN. 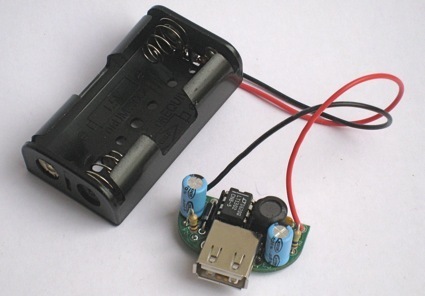 Connect the 5V power adapter to the RPi’s micro-USB port. This will power it up. The red LED marked “PWR” will turn on. This indicates that everything has started up properly. Now it’s time to try and connect to it over Ethernet. How, depends on your platform. On Windows, you can use the putty program. On Mac and Linux, the built-in “ssh” command will be perfect. 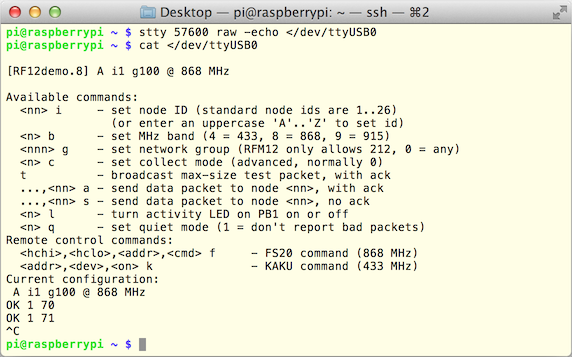 But first, we need to solve a small network puzzle: what IP address does the RPi have? There are two ways to find out: 1) have a monitor plugged into the RPi when it boots up, and the value should show up on the screen, or 2) consult the “DHCP client table” in your network router, which is usually the DHCP server for your local network. In my case, the IP address is 192.168.1.127, so that’s what I’ll use in the rest of this post. Bingo, you have logged into your RPi – welcome to the Linux command line! It’s a menu-based step, just type sudo raspi-config, and once finished, reboot the system (by typing the command sudo reboot). This last step is essential in this case. Then wait a minute or two and log back in as before. You’ll again be connected to the Linux “shell”, patiently awaiting your command(s). If it’s all totally new to you, then trying out a few commands to familiarise yourself might be a good idea at this point. See this site for some tips and ideas. As long as you use the “sudo” command with caution, which gives you full “superuser” (admin) rights, there’s not much that can really go wrong. And if things ever get totally out of hand, you can always get back to this starting situation by re-formatting the SD card and starting over. 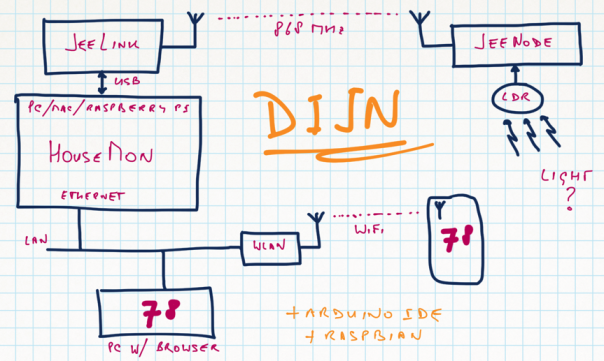 In the next step, we’ll make the RPi the central node of our Wireless Sensor Network. Welcome to the fifth instalment of Dive Into JeeNodes. Linux, anyone? It’s really the Arduino story all over again, but for a different audience and with a completely different hardware and software underpinning. As a matter of fact, the “RPi” as it’s often called, can run the Arduino IDE on-board, which means these two platforms are really complementary in actual use. The performance of this ARM board with on-board GPU is very impressive, but it’s no match for computers with a modern Intel processor (nor does it need to be, at that price!). As a ballpark figure, think of it as 1/10th to 1/20th the performance of a i5 or i7. One way to use the RPi, is to hook up a USB keyboard and HDMI monitor, but in the context of DIJN, we’re really more interested in using this thing as a little server on the network. Note that a RPi can easily be used for both, and that all you need to handle different scenario’s is a couple of SD cards, each configured with the proper Linux system. You could also install a full GUI and still use it as a server, but the goal here is to start as simple as possible. There are already enough things to get to grips with as it is. 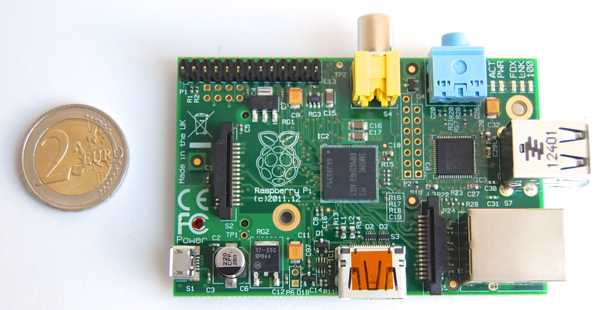 The Raspberry Pi Model B comes with built-in 10/100 MHz wired Ethernet, which is what will be used here. With a few extra steps, it’s also possible to plug in a WiFi dongle and connect to your in-house WLAN. Get a new SD card – 4 .. 8 Gb will be more than enough. There can be significant differences in performance between SD cards from different vendors, so if you’re keen on squeezing the max out of this setup, google for good choices. I’m getting excellent mileage out of Platinum’s 4 GB Class 10 SDHC cards. Download the latest SD image from here, which is based on Raspbian, i.e. Debian for the RPi. This is a 500 MB download. Unzip to get an SD “image” of just under 2 GB. Follow the instructions on this page, using the section which applies to your platform. You have to be careful, it’s possible to wipe-out your workstation / laptop hard drive if you make a mistake with disk names! For the next step, you’re going to need a Raspberry Pi model B, a 5V power adapter with micro USB connector, and an Ethernet cable to hook it all up to your local network. 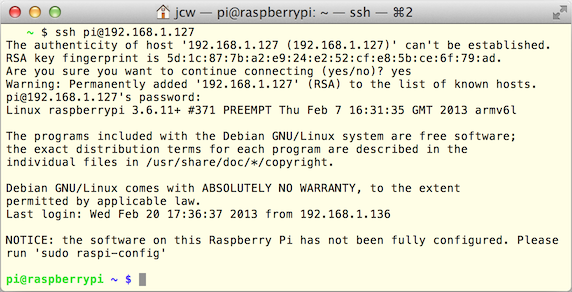 PS – The DIJN.12 post has a link to a fully-configured Raspbian + HouseMon SD image. Welcome to the fourth instalment of Dive Into JeeNodes. Let’s go wireless! As delivered, JeeLinks and JeeNodes come with the RF12demo sketch pre-installed. This can be used for a variety of tasks, including basic configuration and basic packet reception. 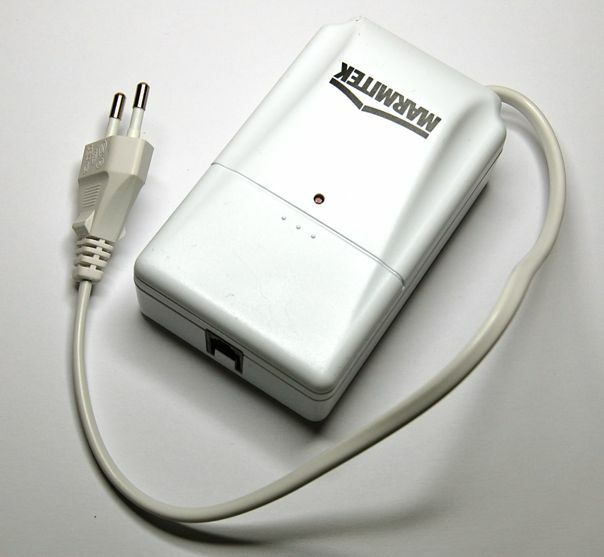 Plug in the JeeLink – it will briefly flash on its red and green LEDs. Start the Arduino IDE, and go to the Tools -> Serial Port menu entry. Then, make sure to select the JeeLink, which will show up as a second serial port (assuming you still have the other JeeNode plugged in). In the IDE, click on the right-most button, the one with the magnifying glass, to bring up the “Serial Monitor”. If you only get gibberish, you need to adjust the baud rate popup in the lower right to 57600. If you don’t get anything: double-check that you selected the correct serial port. The frequency band must be set to 868 MHz. Note that this may differ from the unit you have, and the frequency used in your part of the world, but all JeeLinks and JeeNodes can operate in any of the 433 / 868 / 915 MHz bands. The only difference is that the power and range will be dramatically reduced in bands for which that wireless module is not optimised. In this case, we don’t care (yet), since the first tests will be across less than 1 meter, which can easily be bridged in any frequency band. The “net group” must match between all transmitters and receivers, to allow them to pick up each other’s packets. In this case, we need to use group “100”. The “node ID” is normally different for each node, so they can tell each other apart. For a central node, it’s usually best to pick the special ID “31”. 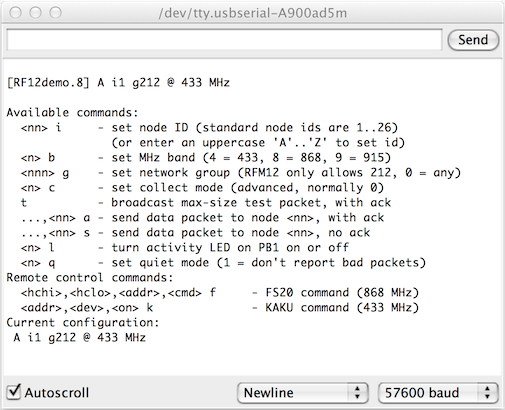 The “OK” text indicates reception of a valid packet (you may also get some “?” packets, which are usually caused by picking up noise or other 868 MHz transmitters), the first byte indicates that this is a regular packet broadcast coming from node #1, and the second byte is the counter, incremented for each new packet, as you can see in the test1 source code. Congratulations. You have created your own Wireless Sensor Network. Well, no actual sensors yet, but we’ll get to that soon enough. First, we need to look more deeply into this thing called a “Ra(h)spberry P(h)i” (here’s a little exercise to get you started). Welcome to the third instalment of Dive Into JeeNodes. Some real hardware now! 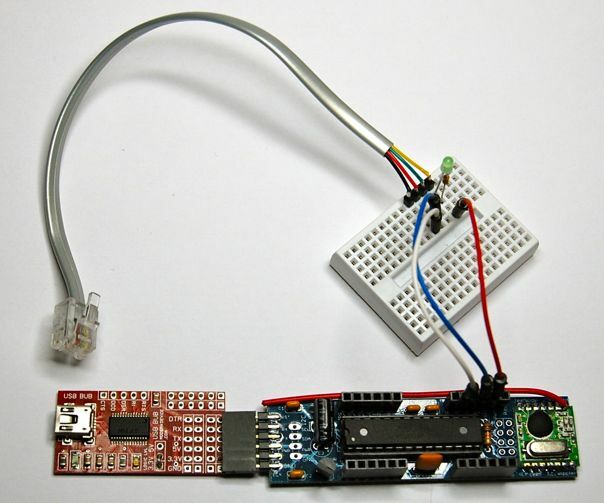 Both the remote sending side and the more nearby reeiving side of the wireless sensor link are handled by a JeeNode – which is essentially an Arduino-like microcontroller with some support circuitry, plus a low-power wireless radio module. 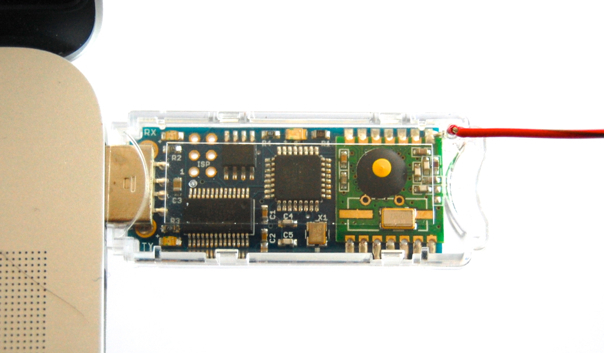 The JeeLink is a modified version of a JeeNode in a USB-stick form factor and enclosure. But let’s start with that remote JeeNode first. What we’re going to set up is a little self-contained unit with a light sensor, a battery pack to power the whole thing, and the proper software pre-loaded onto the ATmega328 microcontroller inside that JeeNode. The whole point of this “node” is that it’s completely autonomous. You’ll set it up once, take it to the place where you want to perform the light level measurements, hook up the battery pack, and that’s it. Its only task is to periodically measure the current light intensity, and report it over wireless – so that we can pick up the signal and pass it to the Raspberry Pi in a central location in the house, collect the data, tie it into the web server, and make it available on the local Ethernet network for visualisation in the browser. As it so happens, JeeLib now includes an example sketch which does exactly that – see test1.ino on GitHub for the code (make sure you have the latest version of JeeLib!). Go to the “Tools -> Serial Port” menu in the IDE, and select the serial port under which the USB BUB has registered itself. The actual name will depend on the platform (Windows, Mac OSX, or Linux) and in the case of Mac OSX, also on the unique name of that particular USB BUB. Go to the “File -> Sketchbook -> libraries -> JeeLib -> DIJN -> test1” menu. This will load the test sketch. To check whether the code is in good shape, click on the leftmost round button with the checkmark in it (or go to the “Sketch => Verify / Compile” menu – same thing). The value may differ a bit, but this indicates that the sketch is ok and can be uploaded. The last step is where the real upload takes place, and since it includes the compile step, you could in fact have skipped that last instruction above. Click on the second button from the left (the one with the arrow pointing right). If all is well, you’ll see some LEDs blink the USB BUB, and when all is done a promising message “Done uploading.” will appear in the IDE (in the middle green bar). If you get an error, make sure you have selected the proper board type (menu “Tools -> Board -> Arduino Uno”). Still no luck? Check that the USB serial port connection, the cable, the BUB, and the JeeNode are all hooked up as shown above. When in doubt, disconnect and reconnect gently. Getting through this first upload is an important milestone. There are a few trouble spots, depending on the platform you use. You may have to install the latest FTDI USB driver. You may have to check that the serial USB drivers are present. There is not much generic advice to give here – other than “google for the error message you get”, in the hope that others have run into the same issue and that you’ll find a page with solution or tip. At this point, you should see a brief LED flash once a second. This indicates that the JeeNode is running the test sketch and sending out its counter packet once a second. Congratulations, you have set up a live test node for your wireless sensor network! Welcome to the second instalment of Dive Into JeeNodes. Let’s get going! DIJN differs from a conventional laptop / workstation setup, in that it will be interfacing to the real world via microntrollers running our code. To get that code onto these devices, we need to cross compile the software on our (big) computer running Windows, Mac OSX, or Linux, and then upload it into the permanent memory of a microcontroller chip. 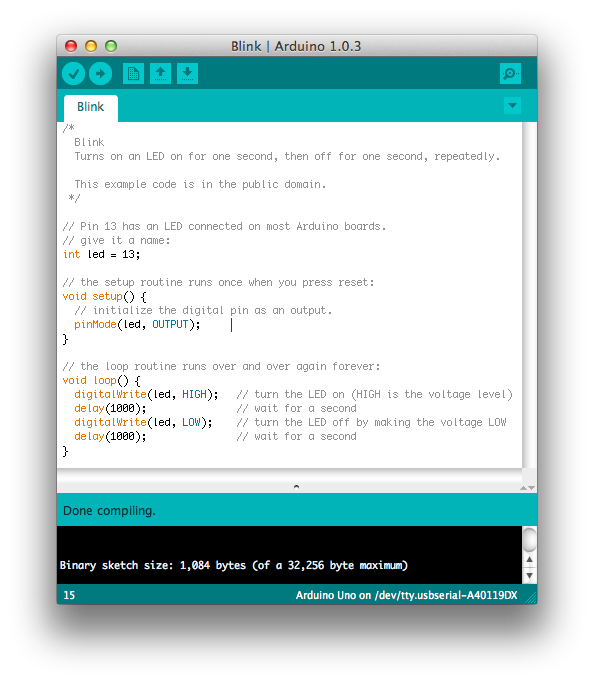 The Arduino has brought this approach to the masses, by providing an open-source IDE to develop, compile, upload, and run the software in the form of embedded software (called “sketches” in Arduino-speak). The success of the Arduino is partly due to the fact that these tools have become easy to install and use. Before the Arduino era, cross compilers were complex, platform-specific, and too expensive for personal use in small projects. Now they are free, open source, extensively documented, and surrounded by a vibrant community. As a first step, we need to perform that installation. This process is fully described on the Getting Started with Arduino page. The recommended version is Arduino IDE 1.0.3, at the moment. Note that you don’t have to follow all the steps (1..7 on Windows and Mac OSX are enough), because we’re not going to connect any hardware or upload any software just yet. Go ahead, perform the installation now. Should take no more than 15 minutes, normally. Congratulations, you’ve installed a fairly large package and it’s all running as expected. But, wait… what is this thing? And why do we need it? The “Integrated Development Environment” is where we create the software that ends up running on our microcontroller(s) – be it an Arduino, a JeeNode (which can be used just like an Arduino Uno because it has the same ATmega328 microcontroller), an RBBB, or a range of other similar products. 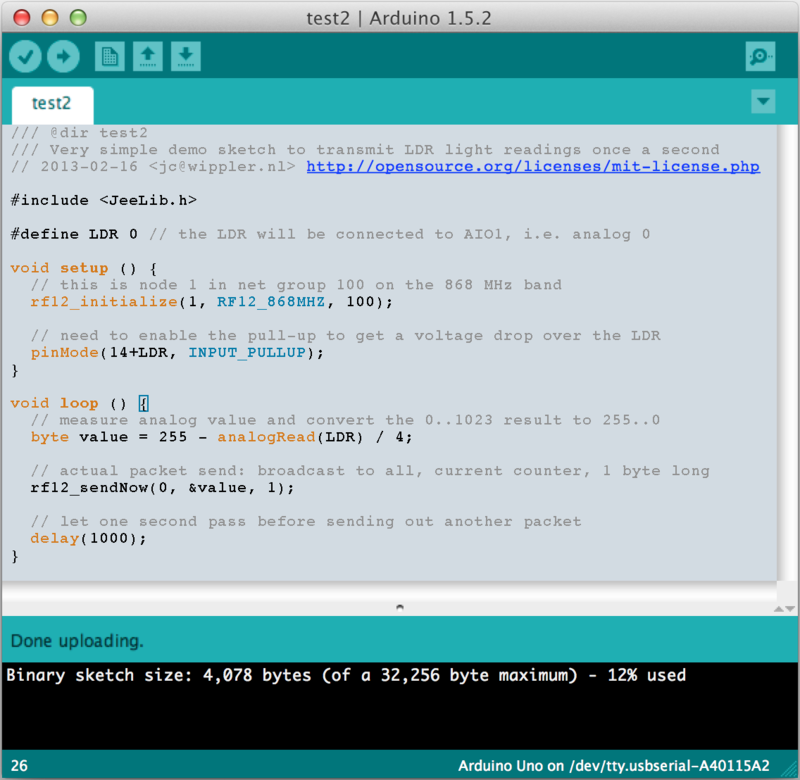 The Arduino IDE is an editor, a compiler (translating the program source text into some obscure binary code which one particular type of microcontroller understands), an uploader, and a serial terminal interface – all rolled into one app. If your background is PHP or Python, you may want to read a bit more about compiled languages. The IDE also defines various conventions for how and where to store different pieces of software if we have more than one microcontroller, how to deal with standard libraries obtained from other software developers, and which type of microcontrollers we can handle through this environment. All of this is essential during development, but once the compiled code has been stored in the microcontroller, it’s not really needed anymore. In day-to-day use, the IDE plays no role – until we decide to make changes, add new features, extend the code… or fix bugs. Then the whole process kicks in again – we load the sketch we were working on back into the IDE, make the changes, compile, upload, try things out, and again: once it works, the IDE can be closed and left alone. Note that there is no way back: you can’t get code out of a microcontroller and turn it into the source text you wrote. So an essential part of the IDE is to help you manage all those different tasks and versions used for different microcontrollers in your (usually growing) collection of remote sensor nodes. It’s a good idea to think about how you name stuff and where you put it, because you’ll want to find it again whenever you fire up the IDE. So we write (or use someone else’s) code, as a “sketch” for a particular task, and we upload it into one or more microcontrollers in the different remote nodes. We give these sketches names, and we use the IDE to keep a copy of each of them, to be able to improve / refine / fix / alter the logic of certain nodes at any time in the future. Some people spend all their time in the IDE (because that’s where lots of code is created). We usually call ’em software developers, although I think IDEalists sounds a lot nicer! Software can grow to become quite complex. Yet some parts are going to be used over and over again in different sketches. In the case of wireless JeeNodes, the best example is the “RF12” wireless driver, i.e. a piece of software which takes care of sending and receiving wireless data packets. This sort of “standard” extra functionality is usually made available as software libraries. 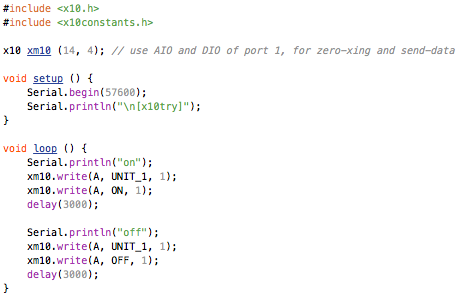 In the Arduino IDE, such libraries can contain the re-usable code as well as example sketches to try everything out. The library we want is called “JeeLib”, and is documented here. We need to add this essential ingredient to our IDE. It has been developed and extended by JeeLabs and other people over the years, and the latest version of this code is available from GitHub – a popular place for a huge range of open source software projects you’re likely to want to use. The GitHub website is enormous, but easy to search and navigate. Installation requires some care, because we must download the entire set of files and put it in a specific location for the Arduino IDE to be able to find it. There is a good introduction on how to install libraries. To download the latest version of JeeLib, click on this link, which you can also find as a “ZIP” button in the top left of this page on GitHub. Unpack and rename the resulting folder to just “JeeLib”, then follow the instructions on that how to install page. Quit the Arduino IDE and then restart it, so that it will pick up all library changes. Found it? Terrific. You’ve completed the software installation for embedded Arduino and JeeNode use. As far as the software required for DIJN is concerned, your laptop / workstation is ready to rock. The purpose of these articles is to introduce you to the world of Physical Computing and Wireless Sensor Networks in an easy to follow way. We will create a low-cost setup to let you track the light level of some spot anywhere in your house and present this information on any computer, tablet, or mobile phone with access to your home network. your time, your attention, and your enthusiasm, of course! In case you’re wondering: the Wireless Starter Pack includes much of the above. None of this is set in stone. It’s possible to replace the Raspberry Pi with another board, or even run that part on your exsiting workstation, laptop, or server. You could use two JeeNodes, or replace the JN SMD + USB BUB by a JeeNode USB, or even create your own variations – but to limit the scope of this DIJN series, the above will be used here. 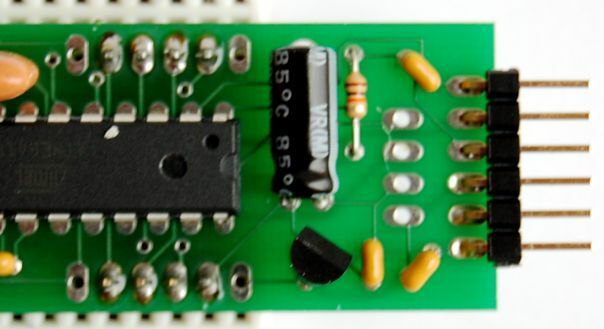 Note very specifically that you will not need to solder anything for this setup, although it’s very likely that you’ll be itching to do so once the basic system is working – because that’s how you can get more sensors and remote control features in there. The final result will be something you can leave on, consuming a fraction of a normal PC’s or even laptop’s power – fully unattended, running a dedicated built-in webserver where everything gets configured and where the up-to-date light level “readings” will be available. It might not sound like much… but don’t jump to conclusions just yet! This is a truly minimal setup. It ought to be possible to assemble this in say a weekend, even if you’ve never done any hardware or software development before. The total cost should remain well under €150, more or less evenly split between the two JeeNodes + sensor and the Raspberry Pi + power and cabling. It’s still a significant amount of money… for which you could also buy a game console, or go watch all the latest blockbuster movies in 3D. With the DIJN setup presented here, everything just mentioned becomes something you can investigate, explore, tinker with, alter, extend, improve upon, or simply… learn from! Not only is everything open source, and hence ready to be explored, it’s also virtually risk free: even if you were to damage something (which is surprisingly hard, with a few simple precautions), it would be in the context of a very limited and low-cost setup. Just add an extra wireless node, and go solder things together for the first time in your life. Or look into that Linux stuff which drives the Raspberry Pi. Perhaps you’re curious about WebSockets and real-time software. It’s all there. It doesn’t bite. It’s probably easier to understand, because small systems have to be simple by design to maintain their low cost. Yet at the same time, it’s all really state-of-the-art in many ways. The power levels and battery life achievable with JeeNodes is measured in years. The performance of the Raspberry Pi is such that it can actually drive a display with full-screen HD movies. And the Node.js-based web server technology we’re going to use is at the forefront of what the web has to offer today. This isn’t some mix of technologies cobbled together “just because it works”. Under the hood is what drives our technological world today, and a glimpse of what will be evolving into the technology of tomorrow. Then again, not everything is going to be spelled out in baby steps, and where possible, pointers will be supplied to point to instructions elsewhere, such as how to set up the Arduino IDE, or how to prepare an SD card for use as bootable system in the Raspberry Pi. The goal is really to reach that finish line, for everyone who’s interested, regardless of specific knowledge. I.e. a working system, spanning a surprinsigly wide range of topics and technologies, but by necessity a very simple system. The idea is that once you have a working setup, you also have the foundation for diving in deep, to explore whatever aspect interests you most, and to alter and extend as much as you like. This series will not explain how everything works. Nor go into more advanced topics such as implementing ultra-low power modes in the sensor node. Or extending the web server with huge amounts of logic and web page presentation. That’s step 2 (and 3, and 4). I’m quietly hoping that a few people will try and follow along right away though, and hopefully also comment on where information is incomplete or incorrect. But even if you don’t have the time or opportunity to tag along as this unfolds, please note that this series of posts will be available from the Dive Into JeeNodes page on the Café wiki. There’s a lot to cover. And I hope there is something in here for everyone. Last but not least: please do comment and make suggestions. That’s how weblogs like this work best. If you don’t manage to get your order in before these dates, we will still process it right up until the 22nd Dec, but since the sleigh and reindeer are out on a rush job, you take your chances …. Let’s go some more into home automation – the X10 power-line system in this case. I used the Arduino X10 library (had to mess around with the use of headers to get rid of compile errors, and enable the pull-up on the zero-crossing input). There’s also a X10 receiver built into the XM10E, which I’m going to ignore for now. X10, in its simplest and oldest form, is a power-line transmission system, i.e. the signals to control a switch are sent over the same wires as the AC power itself (using a 120 KHz signal injected at the zero crossings). Proper mains isolation is essential, of course – as built into the XM10E unit. It’s hard to miss – the relay built into that thing switches on and off with a very loud “clunk”! The power consumption of this switch is 0.6 W off and 0.9 W when on, according to the Cost Control. Not bad, until you start installing many dozens of these switches around the house … then it will add up! Plug in Ethernet, plug in power, done. The box registers via DHCP. Figure out its IP address, and follow the New Plugger instructions. That’s it. Ubuntu 9.04, running on a pretty amazing little box. Effortless! I’m seeing about 3.5 W, doing nothing and hooked up to 100 Mbit ethernet. Close enough. Mighty impressive for a 1.2 GHz processor with 512 Mb RAM. Here’s a brief review of it. This could make a pretty nifty “home monitoring and control center”. I’m not going to limit my options to this, the plan is to support a wide range of platforms – but still, this ShevaPlug sure is a comfy unit, almost like a desktop! Stuffed with lots of brown paper. 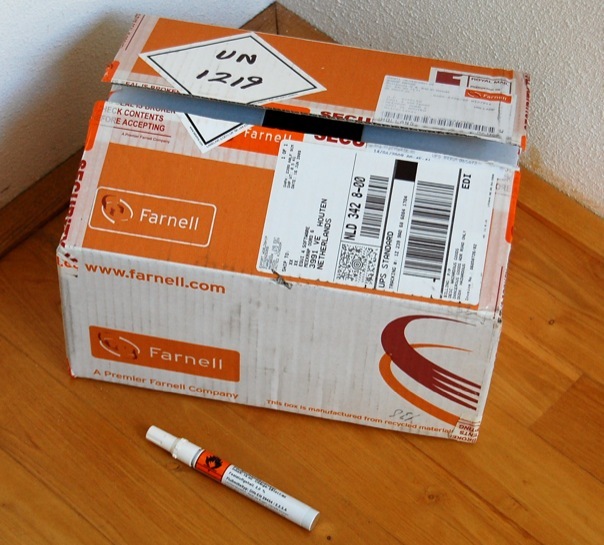 And the contents was that single item laid out in front: a 15 ml resin flux pen! Flammable, sure. But does it really have to be delivered that way? As a separate shipment and delivery? And by UPS, those huge brown trucks – always the largest delivery vehicles coming here. The regulator on the top is an LP2950-3.3, the regulator on the bottom is an MCP1702-33. Same voltage, same TO-92 package, different pinout. The board was designed for the LP2950, but the MCP1702 is cheaper and can supply more power (250 mA vs. 100 mA). Haven’t compared dropout voltages yet – if either one can deliver 3.3V from a 3.7 V LiPo battery or even from 3.6 V NiMh’s, then that would be a plus. Still in manufacturing, but it’s becoming very real now! That’s 640 watt and 1.333 m3/hr. These values are normally updated a few times a minute. There are still some wrinkles in the software, such as the gas consumption not adjusting properly when the meter stops fully, i.e. when no pulse is received once the central heating turns off. Only the first 3 items above need to be always on, with a combined power usage of less than 10W. Every 3 seconds, sensor readings are transferred and stored on the server, using a trivial text format for now. This proof-of-concept setup uses rsync to transfer the log from the server to the notebook every 20 secs, so the above window isn’t yet as real-time at it could be. 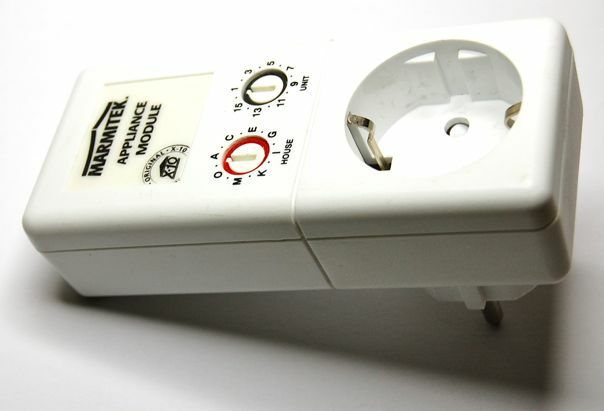 But even with such a crude setup it is easy to keep an eye on consumption – and by simply switching appliances on and off one can deduce their approximate power consumption. 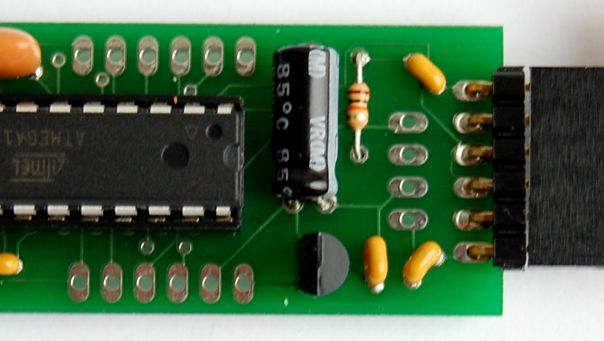 The top one uses a QRD1114 sensor, which produces an analog signal, whereas the lower one is based on the SY310 with a built-in comparator to generate a digital output. The intended range is around 5..15 mm, hopefully just right to detect the 0-digit reflector on the gas meter and the the rotations of the energy meter, respectively. Both of these sensors are connected to a 3-wire audio jack cable: shield = ground, ring = +5V, and pin = signal. 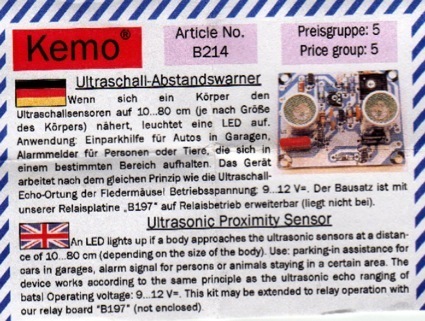 Both sensors use a 330..470 Ω resistor to drive the IR-LED and a second one of 10..100 KΩ as pull-up for the output signal. Ouch. 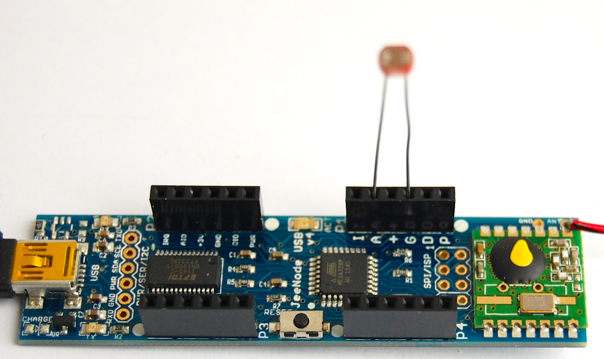 It looks like there are two different Arduino Mini Pro’s around – a 5V @ 16 MHz and a 3.3V @ 8 MHz version. I thought I had the latter, but a quick check tells me otherwise. Which is no good when you’re trying to hook up 3.3V modules that do not tolerate 5V levels! 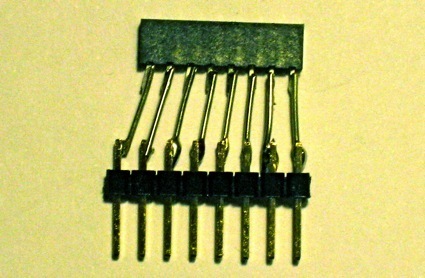 The obnoxious 2 mm vs. 2.54 mm pinout. Yuck. Now, instead of driving the car up to the point where some cardboard boxes leaning against the wall move, and then backing up, I can drive until a red LED comes on, and then, ehm… back up ever so slightly until the LED goes off. Progress! Well, at least it gets rid of the old cardboard junk I was using as “bumper”.